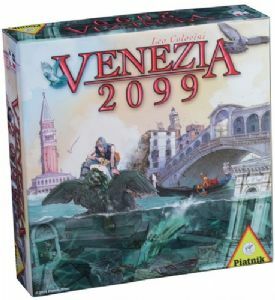 A sad prophecy for the wonderful city of Venice: the fact that it will be sinking into the sea seems to be inevitable. Venice is a city built on more than 100 islands. The water, however, surrounds the city and when it rises, you will great bodies of water form and the ever-disappearing streets will be impassable. What will the future of Venice hold? numbers equating with higher value). Each player is also dealt 5-9 cards and receives 9 coins. The game ends when all dealt cards have been played. On their turn, players must play their lowest numbered card. The cards are numerical from 3-8. When playing a card, the tile that has the same number is flipped over to its water side, eventually flipping a tile with a player's token. Players use the two gondola cards, enabling them to rescue their tokens to another tile. The tokens excavate treasures by travelling to a specifically coloured tile and exchanging one coin for the corresponding coloured treasure. When all cards have been played, there remains part of the map that is not submerged. These remaining tiles are used to calculate the value of the treasures by rarity.